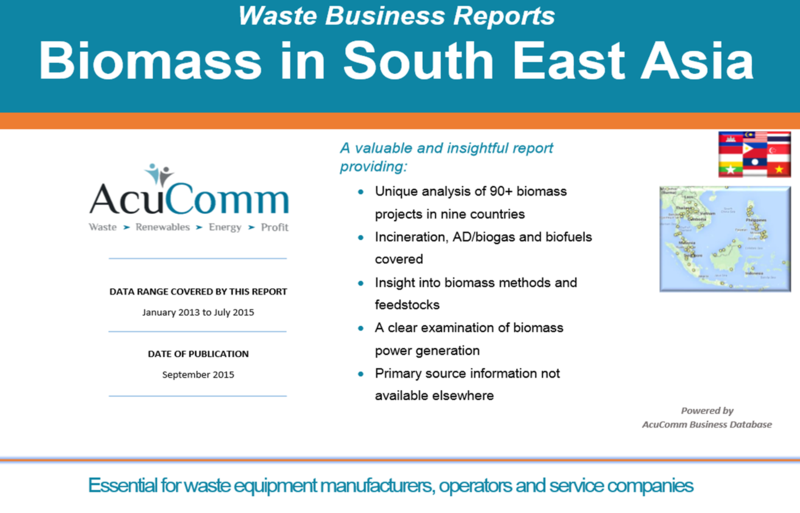 AcuComm’s Biomass in South East Asia Business Report is again our most popular this week! This valuable and insightful report provides you with unique analysis of over 90 biomass projects spread across nine countries, as well as a clear examination of biomass methods, feedstocks and power generation. Powered by AcuComm’s proprietary database, the report is specifically designed to give organisations the business critical intelligence they need to develop effective growth strategies. For more information and to take a look at the alternative reports that AcuComm has to offer, click here. Waste-to-Energy (WtE) technologies consist of any waste treatment process that generates energy in the form of electricity, heat or transport fuels. Adapting these technologies and economies of scale are key to the success of the 3 Es (Environment, Economic Development & Energy) and China is considered a forerunner. 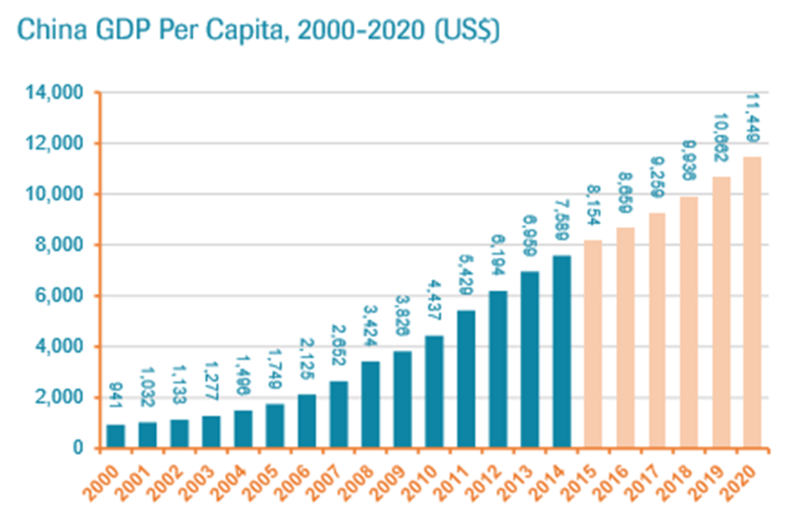 Moreover, as mentioned in our previous blog, the Asia-Pacific region is expected to see anything from two-fold to 8% year-on-year growth over the next decade. WtE markets in this area are likely to be driven by the rapid growth in residential and industrial waste, which has risen largely due to increasing GDP per Capita. Governments now also have a stronger focus on sustainable energy policies which further emphasises the need for greater investment in these markets. The Chinese population currently stands at around 1.4 billion and is growing by around 0.5% every year. 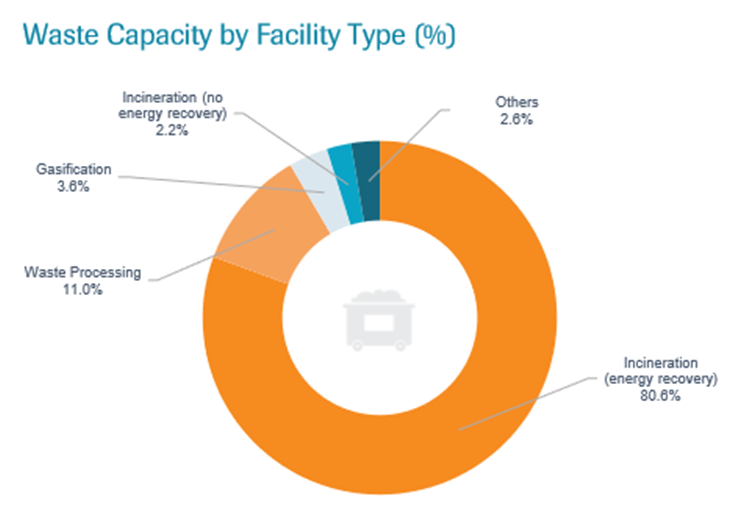 The focus for investment in the waste sector is very much on WtE incineration, which is the leading source for power generation in the country and accounts for over half of featured projects included in AcuComm’s Business db database. Many local authorities consider WtE incineration to be a greener alternative to landfill and this is helping to increase its popularity. South East Asia is another region that represents a rapidly-growing population as it exceeds the 630 million mark. All countries in the area have extensive agricultural sectors and these generate high levels of waste biomass, with over 90 projects detailed in AcuComm’s Biomass in South East Asia Business Report. The largest proportion of projects again involves incineration methods, with the average project worth around US$98 million. AcuComm’s monthly publication of Business Reports seeks to answer the questions that surround a particular waste sector. The China report provides a unique analysis of 120 Chinese waste projects, an insight into waste management methods and trends, as well as a clear examination of waste capacity and power generation. In comparison, the Biomass in South East Asia report features projects from over nine countries across the region, an insight into biomass management methods and the companies and technologies that are involved. This in-depth, focused and strategic analysis is not available from other sources and is vital for organisations currently or planning to sell into the Renewables & Energy from Waste industry. Keep up-to-date with our current and upcoming reports by clicking here. To find out how AcuComm could help your business in the same way, contact us to arrange a demo of our services today. According to a report by US consultancy Transparency Market Research, the global waste-to-energy market is expected be worth more than $31.8bn (£20.35bn) by 2019, largely driven by rising concern towards energy security and growing regulatory support and funding. As well as this, factors such as lower greenhouse gas emissions from landfills and taxes are also believed to affect the global waste-to-energy market. Currently, the global leader in terms of feedstock for power generation is wood. AcuComm’s db Monitor currently shows that waste products, wood chips and specially-grown forestry products account for 12,332 MW (38.4%) of the power generation total. Municipal Solid Waste (MSW) then follows this, accounting for 7,295 MW (22.7%). Other major feedstocks include plant biomass waste and other unspecified organic materials. Countries in this region generally include China, Japan, Thailand, Singapore, Indonesia, Philippines, South Korea and more, all holding opportunities for both local and international investors and technology suppliers. Moreover, the Asia-Pacific is expected to see anything from twofold to 8% year-on-year growth over the next 10 years, highlighting the importance of targeting this sector. China is of course the largest country in this region, and incorporating data up to June 2015, AcuComm holds 120 active waste projects from across the country in our Business Finder database. The total estimated value of these projects is US$15.1 billion, equal to an average value of US$126 million per project. The focus for investment in the Chinese waste sector is very much on WtE incineration, as many local authorities consider this to be greener than landfill. 62 projects are currently in our database, equal to 51.7% of the total. However, it’s not just China that represents a rapidly growing market. With a burgeoning population of around 630 million people, South East Asia is another region that is experiencing huge economic developments that require greater and more economical power generation. The Transparency Market Research study also touches on the thought that bio waste will continue to be a trending sector. AcuComm holds 93 active biomass projects across South East Asia in its Business db as of July 2015, and these have an average value of US$94 million per project. These projects involve the use of biomass to generate electricity, either directly or via gas production using anaerobic digestion, biofuel processes or incineration. All countries in this area have extensive agricultural sectors that utilise a range of technologies to generate huge levels of waste biomass – potentially an extremely valuable resource. Gain a unique understanding of what is driving specific Renewables & Energy from Waste sector projects from across the world. Utilise practical sector-specific information to inform business sales strategies and approaches. Access clear, fact-based and strategic assessments of specific key sectors. To see the benefits of AcuComm’s Business Reports for yourself, arrange a demo with us today. In the week ended 25th October 2015, AcuComm added new or updated projects to our Business db database, worth an estimated US$2,866 million and reported waste capacity of 1.7 million tonnes. This takes the total estimated investment value of projects to US$288 billion. The USA was the leading country with 4 projects in total. This was followed by the UK and Hong Kong with 2 apiece. The average waste project is worth US$83 million. There are naturally wide variations in value, due to size, duration and complexity of different types of projects. The Sales Package will provide your team with all the information they need regarding these projects, allowing them to identify and engage with developers, contractors and the people that matter. To take a look at this week’s latest projects, click here. AcuComm’s Business Reports are an unparalleled source of focused information and analysis regarding the global Renewables & Energy from Waste Sectors. This week, Biomass in South East Asia was our most popular report. South East Asia represents a rapidly-growing market of 630 million people and all countries in the region have extensive agricultural sectors. These generate huge levels of waste biomass – potentially an extremely valuable resource. AcuComm has over 90 such projects in its Business db, with a total estimated investment value of US$8.8 billion. For more information on this week’s popular report, click here. The United Nations Environment Programme (UNEP) has released their report that gives a detailed analysis on a global outlook of challenges, trends and policies in relation to waste prevention, minimisation and management. The Global Waste Management Outlook aims to make the case that sound waste management is much more than merely desirable. Sound waste management is absolutely essential. AcuComm were delighted to have been approached by the UNEP for assistance with compiling information for the report. 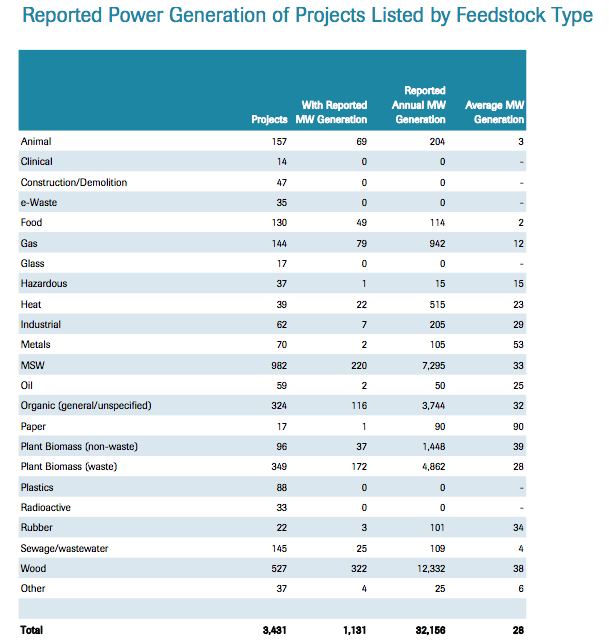 With our considerable research expertise, extensive knowledge of the Renewables and Energy from Waste sector and unrivalled database of detailed ‘live’ projects across this waste and every-changing sectors, the report’s authors were able to gain a unique understanding of the commercial aspects of the growing technology-lead global industry. The report utilises information and data from AcuComm’s proprietary database, Business db, covering investment projects and developments that were active in a two-year period between January 2013 and December 2014. 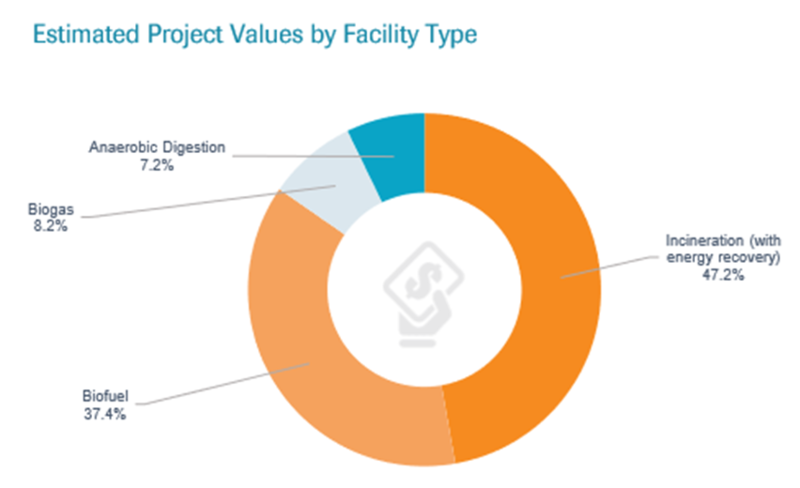 Analysing facility development projects by waste type, Municipal Solid Waste MSW accounts for 28% of all projects by value (85 million USD). Wood and plant biomass and organic waste together account for a further 35% of total global projects. In terms of distribution by geographic area, the UK and the US show major investments, accounting for 24% and 11% of global MSW investment activity by value respectively, while the most active developing countries are the PRC (10%) and India (5%). Our proprietary database has been recommended by ISWA and other businesses and organisations as the only source of reliable and accurate ‘real-time’ information on the latest new Renewables and Energy from Waste plant developments from across the globe. As part of AcuComm’s new Sales Package, our database, Business db, provides decision maker contact information and detailed project knowledge, including location, size, status, feedstock, waste type, capacity and more. To see AcuComm’s involvement for yourself, you can read the full report by clicking here. Marketing needs sales and sales needs marketing. Unfortunately, this does not always lead to a harmonious relationship between the two camps. More importantly, lack of alignment between these two vital functions in the Company can handicap overall performance. When sales fail, marketing blames the sales team for its poor execution of the strategic marketing plan. The sales team, in turn, blames the marketing camp for being out of touch with what really goes on with customers. Eventually this lack of alignment filters all the way up to top management. This is a difficult situation to re-align for CEOs. At the centre of this conundrum lies communication and information. New and ever more sophisticated CRMs have come some way in assisting the alignment of these two powerful camps, but a CRM is of course only as good as the user of it and what is fed in to it. Designed to help you identify opportunities for business growth in the global Renewables & Energy from Waste sectors and then action them, AcuComm’s Executive Package combines ‘real-time’ market insights with practical sales information from our proprietary database. Businesses selling into the global Renewables and Energy from Waste sectors are using the Executive Package every day to inform the strategic focus of the boardroom whilst meeting the practical needs of the sales team. To find out more and experience the benefits yourself, book a demo with us today. In the week ended 18th October 2015, AcuComm added new or updated projects to our Business db database, worth an estimated US$3,841 million and reported waste capacity of 2.8 million tonnes. This takes the total estimated investment value of projects to US$285 billion. WtE incineration was the largest category in terms of waste capacity and power generation in the past week. The USA featured the most amount of projects with 12 in total, followed by the UK, China and Canada. Designed for your sales team, AcuComm’s Sales Package is the most comprehensive and accurate source of ‘live’ practical project information from the Renewables & Energy from Waste sector. Our ‘real-time’ project updates allow you to be the first to know if something changes, meaning you will always be on top of the projects your business is targeting. Our Business Report on Biomass in South East Asia continues to be our most popular and is essential for waste equipment manufacturers, operators and service companies. AcuComm’s Biomass in South East Asia report provides business critical market intelligence for renewables & energy from waste sectors in this region. From the report you will learn which technologies are attracting investment and where the major projects are, as well as how the biomass, renewables and energy market currently stands and how it will likely change. For more information on September’s report, or to see previous ones, click here.